the-puer.com - What is Pu'Erh tea ? What is Pu'Erh tea ? Pu'Erh tea, is a famous Chinese tea originating from a very ancient tradition. It is harvested from particular varieties of tea trees (Camellia Sinensis var. Assamica mostly) in natural gardens of Yunnan Province (South East China). These trees can be very old and even wild. There are two types of Pu'Erh tea : the “Seng Cha” (raw Pu'Erh or green Pu'Erh) and the “Shu Cha” (fermented Pu'Erh also known as “red” or ”ripe” Pu'Erh). A characteristic of this tea is that it mellows over the years, a bit like wine, due to the process of “post-fermentation”. Ripe Pu'Erh also improves with time. Pu'Erh is the name of a small town of the Yunnan Province, once a regional administrative centre and renown for its tea market. From the Tang dynasty (7th century AD) onwards, it was the meeting point of tea caravans taking tea to Tibet on the Cha Ma Gu Dao (or “Ancient Tea Horse Road”). Nowadays renamed Ning Er, this little industrial town still prides itself with being the place of origin of Pu'Erh tea. The name “Pu'Erh” has since been attributed to Simao, which is now the centre of a vast tea-producing area and flourishing tea-market. There are 3 criteria conditioning the branding of “Pu'Erh” tea. The leaves must come from the broad-leaf varietal of tea trees (Camelia Sinensis var. Assamica mainly). The tea is then harvested from three types of trees : the big trees (Da Shu), 50 years old and more, the “old trees” (Gu Shu) some hundreds of years old and the younger trees growing on the hillsides (Qiao Mu, Xiao Shu). We select teas from Da Shu and Gu Shu, which we consider to be the best. 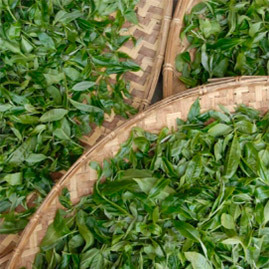 The production must be exclusive to the Mekong basin (mainly Xishuangbanna, Six Ancient Tea Mountains, Lincang area, and Simao-Pu'Erh...). 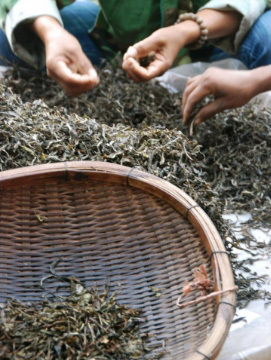 The tea leaves should be dried in the sun , not in oven, in order to obtain Mao Cha, or loose Pu'Erh tea leaves. How to choose a Pu'Erh tea ? The mountain (or village) of origin : each area having its own specific taste due to soil, altitude, exposure, the position in relation to rivers, and the local production methods. The age of the trees. The age of the tea which along with the area of origin, will confer raw or mature flavours to it. 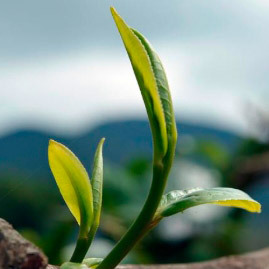 The tea trees grow naturally in a preserved environment, in altitude, in small “gardens”, and far from intensive plantations. In theory, they are not chemically treated (neither fertilizer nor pesticides). The constitution of the leaves and the exposure of the trees naturally avoids most diseases. 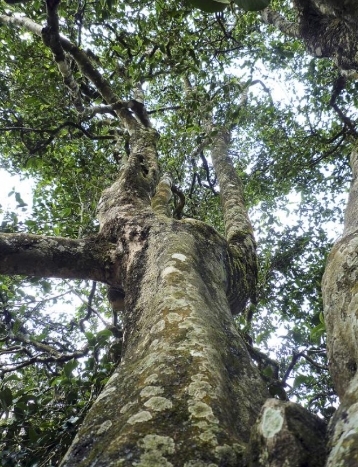 Most of the tea farmers respect these big trees that are part of their heritage, and are a testimony of their history. 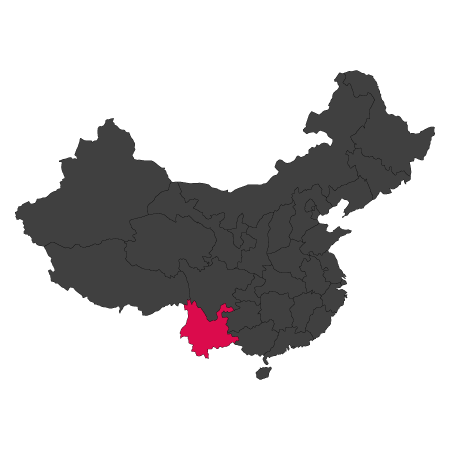 But sometimes, faced with the growing demand in China, the temptation to produce more is strong. We remain very vigilant : the preservation of the tea trees and their environment is a major criterion for our choices. The leaves are harvested twice a year, during spring and autumn. The spring harvest is the most sought after, since the leaves are picked at the end of the dry season and may be therefore richer in flavour. But experience demonstrates that one can also find very good autumn teas. The best harvests consist of a bud and a leaf, or a bud and two leaves, very rarely a bud on its own. Once picked, the leaves are spread out for a few hours in the shade or the sun. They begin to wilt. Then they are briefly heated in a wok, over a gentle wood-burning fire This process, called “ killing the green” or “Sha Qing” in Chinese, halts the oxidization in the leaves and partly removes some humidity. Then they are hand-rolled (some farmers also use machines). This breaks up the cell walls and kick-starts post-fermentation. They are then put in the sun to dry. This stage is particularly important as it maintains intact all the intrinsic qualities and starts off natural post-fermentation. This is mainly why the government of Xishuangbanna has decided it to be one of the criteria authorizing the “Pu'Erh” denomination. At last the tea is carefully sorted. The stems and broken leaves etc... are removed. The raw Pu'Erh tea, then called “Mao Cha”, is ready to be pressed or again put to mature as loose leaves. 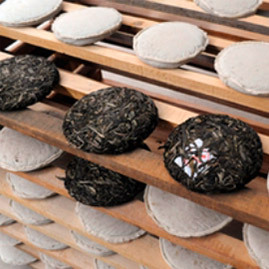 To produce Ripe Pu'Erh, Mao Cha is piled safe from the air, in a naturally moist environment. The fermentation starts quickly and lasts about 45 days. Finally the leaves are dried and sorted again. Where does the tradition of compressing Pu'Erh tea originate from ? In the past, Pu'Erh tea travelled extensively from Yunnan to Tibet with the caravans of the “Ancient Tea Horse Road” (Cha Ma Gu Dao). It was exchanged especially for salt and Tibetan horses. Compressing the tea enabled it to be transported in better conditions and to be kept longer. The Mao Cha is first weighed: each cake, in its traditional form, must weigh exactly 357g - or even 400g in some areas (For ex. The Six Mountains). Then the tea is placed in a cylindrical container of which the bottom is pierced with small holes, and passed through gentle steam for a few seconds. This process humidifies and softens the leaves and the Mao Cha stacks itself. 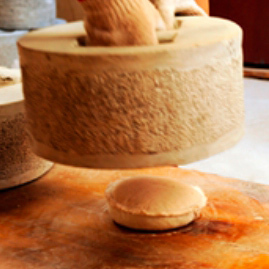 The tea is then put into a cloth sleeve and shaped into a thick cake. Then it is placed under a stone to be compacted. The cake is then removed from the sleeve and placed in a slightly heated drying room for 2 to 3 days. This process can also be done in the sun or in the shade of a ventilated place depending on climatic conditions. This step can take up to several days. Once dry, the cakes are wrapped in paper and dated. They are then stacked by seven in a bamboo leaf casing binded together with ties (also made of bamboo). These are called “tongs”. Finally these “tongs” are grouped by dozen in bamboo woven baskets. The cakes can then begin their slow ripening and mellowing.